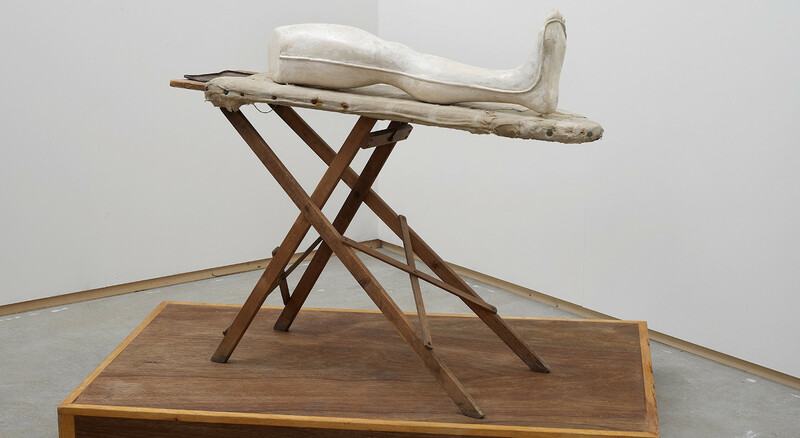 Stuart Brisley, Louise Bourgeois' Leg, 2002, Performance Object, plaster, ironing board, wood. Image courtesy of the Artist and Hales London New York. Courtesy of the Artist. Photograph by Andy Keate. Hales London New York is pleased to announce Stuart Brisley's inclusion in the upcoming exhibition The Body Extended: Sculpture and Prosthetics at the Henry Moore Institute in Leeds. The exhibition runs from 21st July to 23rd October 2016. The artist will also take part in a gallery discussion with Dr Julie Anderson (University of Kent), Lisa Le Feuvre and Jon Wood (Henry Moore Institute) on Wednesday 20th July, 2-4pm. The Body Extended: Sculpture and Prosthetics explores how sculpture has responded to the technological supplementation of the body. Spanning the First World War to the present day, this exhibition of objects, drawings, films, photographs, paintings and archives from medical museum collections, focuses on analogue augmentation to the body, tracing how artists have addressed radical changes to the very thing humans know best: our bodies. The First World War profoundly changed understandings of the human body, and this exhibition traces the means by which the body came to be reconstructed and rethought in culture in the wake of the conflict. It begins with facial prosthetics made by sculptors Francis Derwent Wood (1871-1926) and Anna Coleman Ladd (1878-1939) during the First World War, and includes works by Louise Bourgeois, Martin Boyce, Heinrich Hoerle and Jacob Epstein, and a commission by Rebecca Warren located directly outside the Institute building on the city's busiest thoroughfare. 21 July - 23 October 1016.